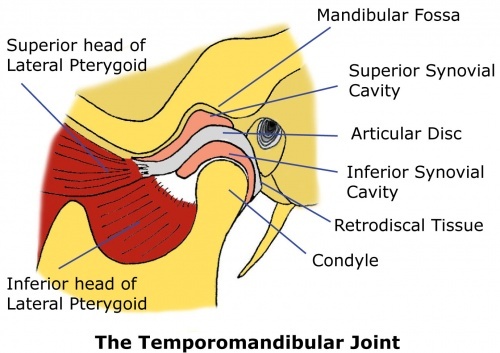 The temporomandibular joint (TMJ) or jaw joint is a bi-arthroidal hinge joint that allows the complex movements necessary for eating, swallowing, talking and yawning. 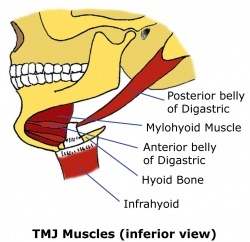 Dysfunction of the TMJ can cause severe pain and lifestyle limitation. Temporomandibular disorders are common and sufferers will often seek physiotherapeutic advice and treatment. Good knowledge of the anatomy of the TMJ and related structures is essential to correct diagnosis and appropriate treatment. Capsule - The capsule is a fibrous membrane that surrounds the joint and attaches to the articular eminence, the articular disc and the neck of the mandibular condyle. Articular disc - The articular disc is a fibrous extension of the capsule that runs between the two articular surfaces of the temporomandibular joint. The disc articulates with the mandibular fossa of the temporal bone above and the condyle of the mandible below. The disc divides the joint into two sections, each with its own synovial membrane. The disc is also attached to the condyle medially and laterally by the collateral ligaments. The anterior disc attaches to the joint capsule and the superior head of the lateral pterygoid. The posterior portion attaches to the mandibular fossa and is referred to as the retrodiscal tissue. 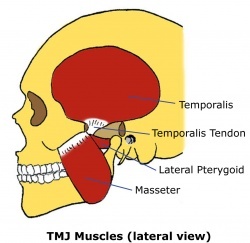 The ligaments give passive stability to the TMJ. 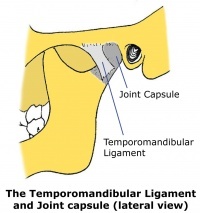 The temporomandibular ligament is the thickened lateral portion of the capsule, and it has two parts, an outer oblique portion and an inner horizontal portion. 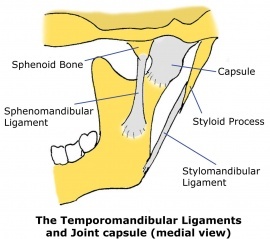 The stylomandibular ligament runs from the styloid process to the angle of the mandible. The sphenomandibular ligament runs from the spine of the sphenoid bone to the lingula of mandible. The jaw can move forward and back, side to side and can open and close. Each of these movements are performed by a number of muscles working together to perform the movement while controlling the position of the condyle within the mandibular fossa. Chewing and talking require a combination of jaw movements in a number of directions. Opening – inferior head of lateral pterygoid, anterior digastric, mylohyoid. Opening is also controlled by eccentric contraction of the closing muscles against gravity. Opening is a complex movement consisting of an early rotary component in the first 2-3cms of movement with a forward glide towards the end of range. The articular disc moves forward with the condyle as it glides forward, effectively extending the superior articular surface of the mandibular fossa. Closing – masseter, anterior and middle temporalis, medial pterygoid, superior head lateral pterygoid. Protrusion – bilateral contraction of the lateral pterygoid. Laterotrusion (side to side) – ipsilateral middle and posterior temporalis, contralateral inferior head lateral pterygoid. ↑ Miloro, M; Ghali, GE; Larsen, P; Waite, P; Peterson's principles of oral and maxillofacial surgery, Volume 2, Chapter 47, 2004. ↑ Langendoen, J; Müller, J; Jull, GA, Retrodiscal Tissue of the Temporomandibular Joint: Clinical Anatomy and its Role in Diagnosis and Treatment of Arthropathies, Manual Therapy, 2(4), 191-198, 1997. ↑ Loughner BA, Larkin LH, Mahan PE. 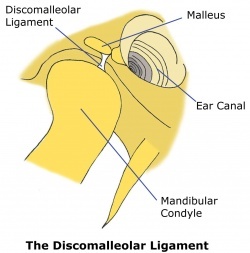 Discomalleolar and anterior malleolar ligaments: possible causes of middle ear damage during temporomandibular joint surgery. Oral Surg Oral Med Oral Pathol. Jul; 68(1):14-22, 1989. ↑ Rowicki, T; Zakrzewska, J. "A study of the discomalleolar ligament in the adult human." Folia Morphol. (Warsz). 65 (2): 121–125, 2006. ↑ Kuttila, S; Kuttila, M; Le Bell, BY; Alanen, P; Suonpaa, J. Recurrent tinnitus and associated ear symptoms in adults. Int. J. Audiol., 44:164-70, 2005. ↑ Ren, YF; Isberg, A. Tinnitus in patients with temporomandibular joint internal derangement. Cranio, 13:75-80, 1995. ↑ Cheynet, F; Guyot, L; Richard, O; Layoun, W; Gola, R. Discomallear and malleomandibular ligaments: anatomical study and clinical applications. Surg. Radiol. Anat., 25:152-7, 2003. ↑ Eckerdal, O. 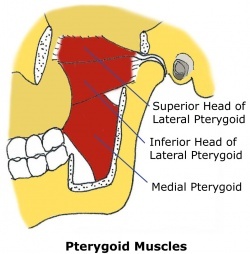 The petrotympanic fissure: a link connecting the tympanic cavity and the temporomandibular joint. Cranio, 9:15-22, 1991. ↑ Kim, HJ; Jung, HS; Kwak, HH; Shim, KS; Hu, KS; Park, HD; Park, HW; Chung, IH. The discomallear ligament and the anterior ligament of malleus: an anatomic study in human adults and fetuses. Surg. Radiol. Anat., 26:39-45, 2004. ↑ Wright, EF; Bifano, SL. Tinnitus improvement through TMD therapy. J. Am. Dent. Assoc., 128:1424-32, 1997. ↑ Ramírez, LM; Ballesteros, ALE; Sandoval, OGP. A direct anatomical study of the morphology and functionality of disco-malleolar and anterior malleolar ligaments. Int. J. Morphol., 27(2):367-379, 2009. ↑ Saladin, KS; Human Anatomy. New York, NY: McGraw-Hill, 2005. ↑ Standring, S, Editor, Gray’s Anatomy, 40th edition, Elsevier, Churchill Livingstone, 2008.